I was working back in the treatment area of the clinic when Dr. S barged through the swinging doors. I vaguely remember one of our elderly clients coming in earlier in the week holding a large picture frame, wrapped in brown wrapping paper. I put her in the exam room with her dog. I remember her walking slowly, grasping on to a walker, so I offered to carry the picture for her. “It’s a gift for the doctor’s!” she said with gleaming eyes. So I leaned it against the exam room table, never getting to see the actual picture. I had completely forgotten about it until Dr. S brought it up that day. As a technician, I don’t have to go into the rooms anymore, so I didn’t see the poodle picture and promptly forgot about it. On Monday, I was back to working reception. I cleaned out room 1 for a client and led them around. I told them to have a seat, and I went to shut the doors. There are two on either side of the room. I shut the first one and jumped nearly half a foot back. 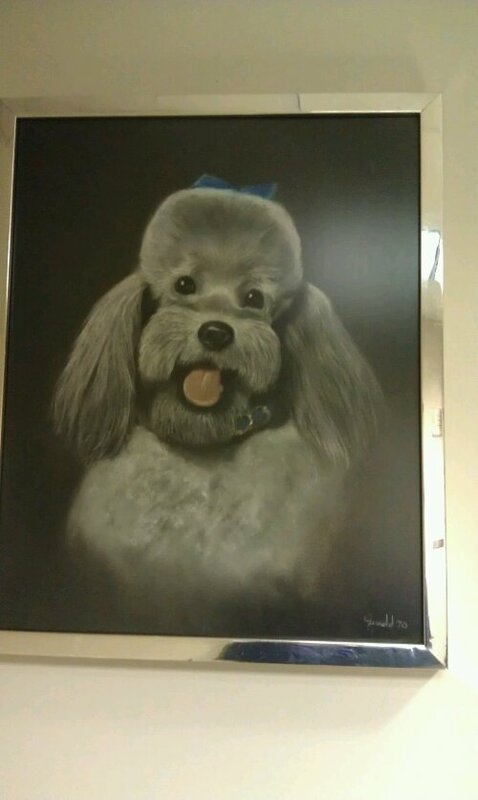 There was the most terrifying poodle portrait I’ve ever seen, and it had been creepily waiting behind that door. I slowly backed out of the room, not taking my eyes off of it. Likewise, it didn’t take its eyes off me. It reminds me of the portraits in cheap haunted houses. No one in our office can really stand it, except Dr. C who has the softest heart and truly loves all creatures great and small. Needless to say, it has been moved to the deepest recesses of the office…in room 6…which we now call….the poodle room.